In his first full season as Arsenal manager, Arsene Wenger guided his side to their maiden Premier League title, and their first top-flight league crown since 1991. The Gunners knocked Manchester United off top spot for just the second time in the Premier League era and capped a fantastic season by winning the FA Cup to complete the double. The title charge seemed unlikely at Christmas for Wenger, who took charge of Arsenal in September 1996, but an astonishing run of 45 points from a possible 51 between 26 December 1997 and 3 May 1998 made them Premier League champions. 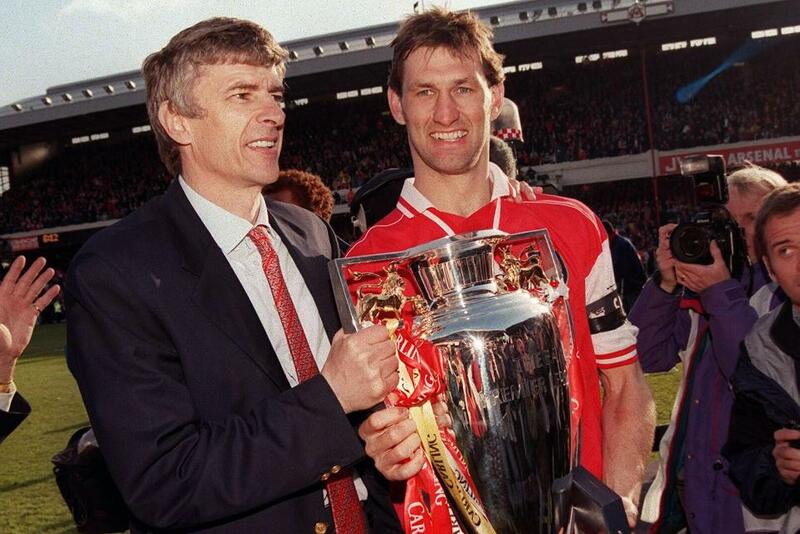 Club captain Tony Adams was the man to wrap up the title, charging on to fellow centre-back Steve Bould's through-ball and firing in the final goal of Arsenal's 4-0 triumph against Everton at Highbury. Despite losing their last two matches, United only moved to within one point of Arsenal and Wenger became the first overseas manager to lift the Premier League trophy. Wenger had prepared for his successful title charge with the additions of Marc Overmars from Ajax and Monaco duo Christopher Wreh and Gilles Grimandi. The void left by Manchester United talisman Eric Cantona, who retired at the age of 30 that summer, was filled by Tottenham Hotspur striker Teddy Sheringham, who missed a penalty on his debut for United at White Hart Lane, which ended in a 2-0 victory for Sir Alex Ferguson's side. Newcastle United, who had finished second in the two previous campaigns, struggled to replicate their form after the departures of Les Ferdinand and David Ginola to Spurs, and the Magpies eventually finished 13th under Kenny Dalglish. It was the club Dalglish won the Premier League title with in 1995 that set the pace this time round as Roy Hodgson led Blackburn Rovers to four wins from their opening five matches, before a thrilling 4-3 loss to Leeds United resulted in their losing top spot. Arsenal overtook Rovers, led the pack until the end of October and were involved in some memorable encounters along the way. Dennis Bergkamp netted a hat-trick, including a sublime control and finish that won the BBC Match of the Day goal of the season, in a 3-3 draw at Leicester City, Ian Wright became the Gunners' all-time leading scorer by scoring his 179th goal for the club in a 4-1 win over Bolton Wanderers, and Nigel Winterburn's thunderous strike from distance clinched a late 3-2 win at Chelsea. The Gunners also beat Man Utd 3-2 in their first clash of the season, thanks to David Platt's late header, but six consecutive wins followed for Ferguson's men, and they topped the table at Christmas, with sixth-placed Arsenal 13 points back. Blackburn were second at this point, with Ruud Gullit's Chelsea in third. Chelsea parted company with their Dutch manager in January 1998, and the Blues were galvanised under the guidance of 33-year-old player-manager Gianluca Vialli, who led them to UEFA Cup Winners' Cup and League Cup triumphs and a fourth-place finish in the Premier League. 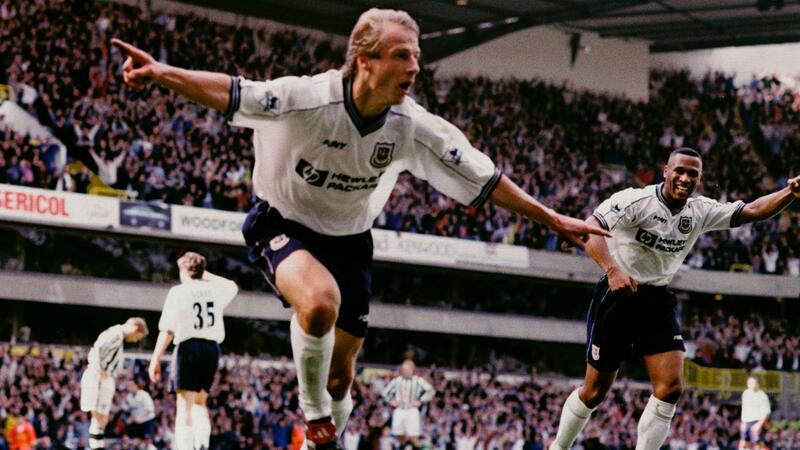 London rivals Spurs were in the relegation zone at the turn of the year, but the return of Germany striker Jurgen Klinsmann, who had lit up the Premier League in his first spell at White Hart Lane in 1994/95, helped to drag them out of relegation trouble as he scored nine goals in 15 matches. His tally included four goals in a 6-2 win at Wimbledon, part of a five-match unbeaten run that steered the Lilywhites away from the drop zone. Spurs' resurgence meant the relegation battle was between Everton and the three promoted clubs, Bolton Wanderers, Crystal Palace and Barnsley. Palace and Barnsley were already down by the final day and Everton stayed up at Bolton's expense on a dramatic last day of the season, meaning all three promoted teams suffered the drop. Everton went 1-0 up against Coventry, and then Chelsea went 1-0 up against Bolton through Gianluca Vialli. Things were looking good for Everton, but Dion Dublin's 89th-minute equaliser put them in danger once more as one more goal from Coventry would send them down. But the Merseysiders dug deep to hang on for a draw, while at Stamford Bridge a late sucker-punch goal from Chelsea midfielder Jody Morris, when Bolton were piling men forward for an equaliser, condemned the Trotters to relegation. At the top, Man Utd were 12 points above Arsenal at the start of March, having played three matches more, but the Gunners won 1-0 at Old Trafford, which proved to be the turning point in the title race. Eight successive victories followed as Arsenal wrestled the Premier League crown off United and began an epic rivalry at the top over the next few years.